This is finally 3/3 of the 3 days of pumpkin ale extravaganza. 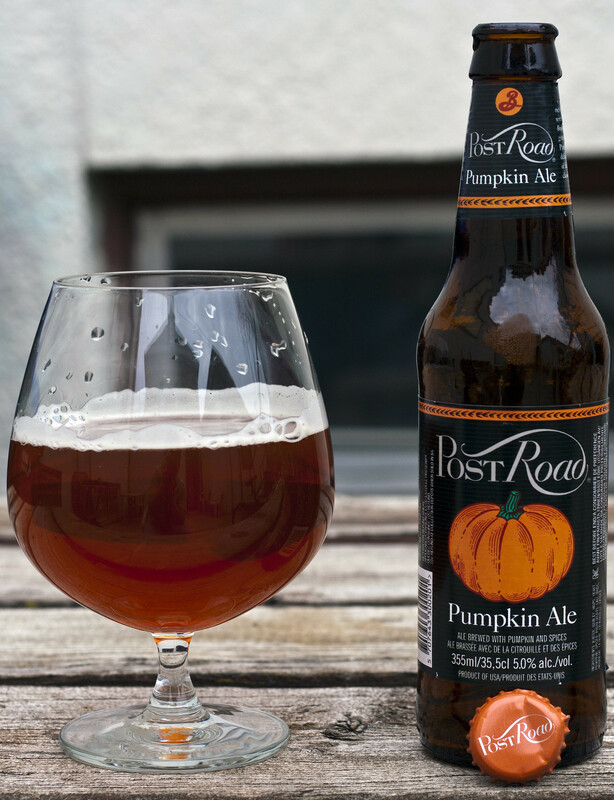 On Saturday I reviewed the Great Lakes Pumpkin Ale, Sunday: the Fort Garry Happy Jack and today, last but not least - Brooklyn Brewery's Post Road Pumpkin Ale, the most widely distributed of the three. This is Brooklyn's first new beer in Manitoba market since their Black Chocolate Stout was introduced in the Manitoba market two years ago, so considering I thought their beer was going to be gradually phased out of Manitoba, I'm glad to see a new(ish) Brooklyn beer make its way here! Appearance: FOAMY galore, it's gushing everywhere, but thankfully I quickly have it under control and got the beer in the glass instead of everywhere but the glass. It's a nutty medium-dark brown colour, clear, beige foam quickly diminishes. Compared to the last two pumpkin ales, this one is more similar in appearance to Happy Jack, which was a clear cherry red beer. Aroma: The pumpkin is more apparent in this beer than the other two. The general aroma from this is again, cinnamon, nutmeg, a bit of brown sugar, and some pumpkin. While opening the bottle, the aroma spewed out just like the foam, but the aroma is now mostly muted until you get near the glass. Taste: The first thing that comes to my mind is more of a brown ale with pumpkin flavours, it's much more muted than I expected, a bit more bitter. The sweetness of cinnamon, pumpkin and nutmeg quickly hit the tongue then dissipate leaving not much to the taste buds, unfortunately. I can't really pinpoint the flavours as the sweetness goes down, but it's bitter, a bit metallic for an aftertaste and only a slight hint of pumpkin. Overall Thoughts: Maybe this is a bad bottle, but I didn't enjoy it. The aromas were inviting like the Great Lakes and Fort Garry takes on pumpkin ales, but the taste really misses it. I was a bit excited when I could taste the sweet autumn flavours hitting the tongue but it's not as strong as I expected, nor enjoyable as I expected as it immediately turns into a metallic and bitter flavour. Perhaps mine was a bad batch? It cost around $3.50 for a 355mL bottle and it has a 5% ABV. Thanks for saving me $3.50 Cody (belated congrats on the new job too). Thanks and just pick up an extra Ft Garry Happy Jack for every Post Road you were going to buy!